As most of our fresh food comes from our organic gardens, our kitchen variety depends on the seasons. The year round we serve fresh salads and carefully selected quality meat. Lukwe is truly the right place to indulge in a healthy meal with an abundance of vegetables on each occasion. The vegetarian meals are delicious and nutritious while meats are tender and tasteful. Lukwe has an a la carte menu, but we love to be creative with food so we also prepare food toward your desire, whether it is African, European or Asian food. Come and challenge us. 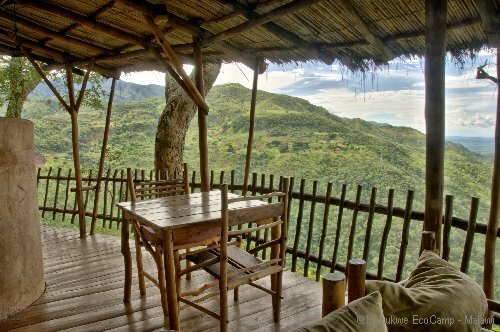 The Lukwe Restaurant serves freh food from our organic gardens. Of course we have our home grown coffee and a good variety of herbal teas. 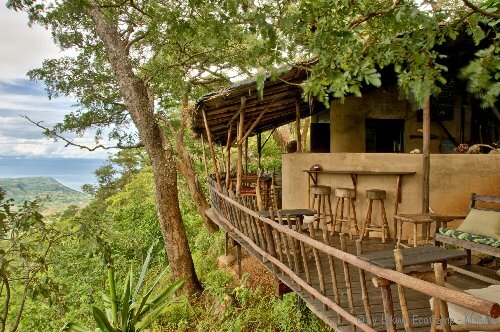 The bar and restaurant with a spectacular view - Lukwe EcoCamp Malawi. To enjoy your meal even more, Lukwe has a good wine selection and a well stocked bar with all kinds of spirits. Beers and minerals are chilled by the sun. Vegetarian meals cost between 5 an 10 US$, our kitchen with a difference has quality meat, prices vary between 8 and 12 US$. Drinking water is for free for our guests.